Some students from the Buffalo Public and Niagara Falls City School Districts have returned from a trip to the Kennedy Space Center in Florida. WBFO's Senior Reporter Eileen Buckley says the students won contests for their STEM projects. WBFO's senior reporter Eileen Buckley says some students returned from a trip to the Kennedy Space Center as part of their STEM work. Some students from the Buffalo Public and Niagara Falls City School Districts returned from a trip to the Kennedy Space Center in Florida. “It’s just been a really great experience,” said Elise Glahe, a sixth-grader at the Abate Elementary School in the Niagara Falls City School District. 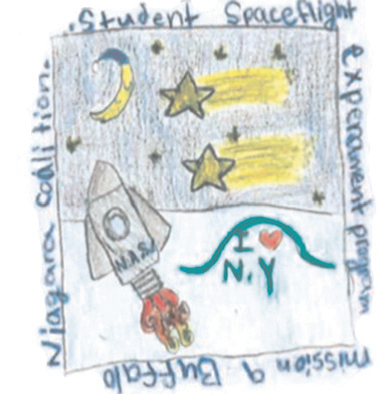 Glahe designed a winning Mission Patch as part of the Student Spaceflights Experiments Program last year. Glahe's mission patch was lifted into orbit this weekend onboard the International Space Station. Elise Glahe, a 6th grader at the Abate Elementary School in the Niagara Falls City School District, winning Mission Patch is now in space. Credit Photo from Niagara Falls City School website. “You made something that, just by chance, has flown into outer space and that’s just such a crazy thing to think about,” Glahe declared. Elise Glahe, a 6th grader at the Abate Elementary School in the Niagara Falls City School District. Glahe and three other Buffalo Public school Students were welcomed back home by Western New York Congressman Brian Higgins Monday at the Buffalo and Erie County Public Library following their weekend trip. Three Buffalo students, known as the Spud Launchers, said their winning project, to try to grow potatoes in space is now in orbit. Gabriella Melendez, Hamlin Park 8th grader in Buffalo. Melendez was the lead investigator of the project. “It should be up there for I think six to eight weeks and then we get our results back, then that’s when you know everything is going to come together and we all find out the results that we’ve been waiting for," Melendez said. The space launch was initially scrubbed over the weekend, but later, while they were driving through Florida, the rocket was launched and they caught it on the radio. “It’s exactly 9:38 and that was our launch time and he pulled over, he turned up the radio and it goes ‘5, 4…’ and you just hear it and it’s like ready to take off and it just went and you heard the wind and you heard everybody’s excitement,” responded Melendez. Buffalo school students Shaniylah Welch and Toriana Cornwell were co-investigators of the experiment. Toriana Cornwell, Buffalo student, was one of the co-investigators of the experiment. “It was pretty cool. We watched a video on all the astronauts and the fallen ones also,” said Cornwell. “I’m looking forward to being an [astronomer]. I’m not too much of being in space – I’m more like research in space – you know, learn about the cosmos and Milky Way and all the galaxies,” Welch explained. Shaniylah Welch, Buffalo student, co-investigator of project. The school districts have been teaming with WNY STEM HUB to promote STEM learning. Buffalo Schools Superintendent Kriner Cash called the young women an “inspiration” in promoting interest in STEM fields. Teacher Andrew Franz was elated for his students. “We also need boys and girls of color to continue to pursue STEM fields as well,” remarked Cash. Their teacher and advisor, Andrew Franz, was elated for his students. “It took every inch of my being to not cry,” Franz said. A collaborative effort between Western New York STEM Hub, AT&T and the Girl Scouts will allow more than 200 Buffalo Public School students, Girls Scouts and teachers to see the movie" Hidden Figures" Saturday. WBFO's Senior Reporter Eileen Buckley says the event is designed to help encourage a new generation of women to consider STEM careers. WBFO's Senior Reporter Eileen Buckley more than 200 Buffalo Public school students & Girl Scouts will see Hidden Figures Saturday. A winning Spaceflight Experiment created by three Buffalo Public School students has caught the attention of the White House. WBFO's Focus on Education reporter Eileen Buckley says three Hamlin Park students will be in Washington Wednesday. WBFO's Focus on Education reporter Eileen Buckley says three Hamlin Park students from Buffalo have been invited to the White House for their winning STEM space project. A team of three students from the Hamlin Park School Public School #74 in Buffalo emerged the top winners as they participated in part of the Student Spaceflight Experiments Program in the classroom. WBFO's Focus on Education Reporter Eileen Buckley says the local students scored big in a STEM competition. WBFO's Eileen Buckley talks to some Buffalo school students about their winning space project.